Online shopping malls such as Lazada, makes our lives much easier with its effortless and super convenient shopping platform. With a record high 91% market share in the Philippine e-Commerce category, no other Philippine e-commerce platform comes close to Lazada, with 6.3 million items under a wide variety of categories. Nowhere else will you find thousands of products across categories including health and beauty, home and living, fashion, mobiles and tablets, consumer electronics electronics, travel, toys, grocery items, and even pet goods. As the country’s dominant online shopping destination, it shows no sign of slowing down . Lazada has been able to guard and grow e-commerce in the Philippines in the 5 years. To celebrate its 5th anniversary, Lazada Philippines will be holding its biggest online shopping party of the year. Brands, sellers and other e-commerce partners are joining Lazada to surprise shoppers with all the perks of online shopping. With a lot to celebrate, the company officially launched on Tuesday, March 14, its biggest shopping event of the season dubbed as ‘Lazada’s 5th Birthday Surprise Sale' at the Discovery Primea Hotel in Makati City. Starting with hot deals and preorders to whet the appetite of eager shoppers, Lazada’s birthday celebrations will peak on March 21 - 23. 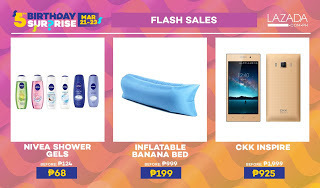 From March 21-23, Lazada will be showering online shoppers with sitewide discounts of up to 90%, low denomination Peso Sales, and time based Flash Sales. There will also be exclusive offerings from its most popular brands, and raffle prizes like vacation packages and real world treats. Shoppers can join the celebrations on www.lazada.com.ph or download the official Lazada shopping app on Android or iOS. For this sale’s top deals, Lazada will be offering a Delsey 4-wheel trolley for only P3,507, JBL on-ear headphones for only P699, and Nyx Lip Lingerie for only P490. Further, there are also VR Box 3D Glasses for only P95, Keds sneakers for as low as P999, and assorted Nestle Dolce Gusto capsule packs with a free Nestle Dolce Gusto Oblo machine for only P3,400. For freebies, Lazada will be raffling off a free trip for two to Taiwan from KKDay. Foodie customers also get free booky.ph subscriptions worth P1,500. Finally, every minimum purchase of P1,000 gives a P10 discount on FamilyMart’s famous Twirl.